Want to truly impress your family and friends this coming holiday season as well as into the new year? You will be able to do so without any issue at all with LG’s latest CineBeam Laser 4K projector. This second generation model will boast of Ultra Short Throw (UST) technology that offers a very minimal space requirement, and yet its compact design is able to project stunningly sharp 4K images on just about any decent flat surface, be it a wall, floor or ceiling. Taking full advantage of UST technology, you might be surprised to find that the LG CineBeam Laser 4K can be placed just a little more than 2 inches from the wall, and yet it is able to project a 90-inch diagonal image. Should you want to bump up the screen size to 120 images, simply place it 7 inches away and you are good to go. Being extremely simple to use and efficient to set up, this particular space-friendly unit delivers stunning viewing experiences on a truly cinematic scale. With hardware that delivers 2,500 ANSI lumens and 4K UHD resolution, the LG CineBeam Laser 4K ensures exceptionally bright and clear images as well as superb black level. The viewer would definitely feel immersed in that particular video clip or movie, and this model is also able to reproduce highly accurate colors thanks to its wide color gamut for a greater degree of realism. Being very small in stature, this projector can be easily moved and adjusted to suit different kinds of environments, further saving time for the user. Visual accuracy is further enhanced courtesy of a 12-point keystone adjustment feature, where it eliminates image distortion that is more often than not the bane of many a UST projector. 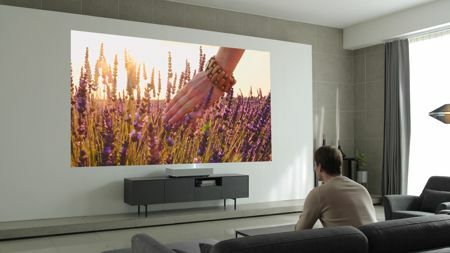 In addition, owners of the LG 4K UHD projector will have no shortage of content to watch, since it has a webOS 4.5 function that delivers convenient access to Netflix, Hulu and other kinds of 4K streaming services. Standard connectivity options on the LG CineBeam Laser 4K projector include USB, Ethernet and HDMI ports, apart from wireless support that plays nice with external devices including a keyboard and mouse.